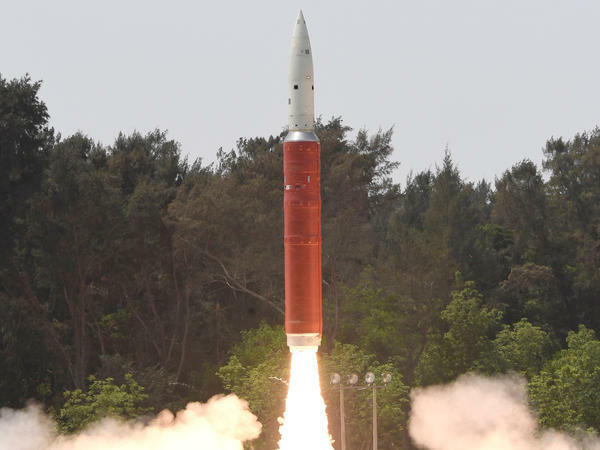 India launched a ballistic missile defense interceptor last week — and NASA says it created dangerous debris in orbit. "We have identified 400 pieces of orbital debris from that one event," NASA Administrator Jim Bridenstine said. When India blew apart one of its satellites orbiting Earth last week, it created hundreds of pieces of orbital debris, and some of those pieces are large enough and high enough to pose a potential threat to the International Space Station, NASA says. "That is a terrible, terrible thing to create an event that sends debris in an apogee that goes above the International Space Station," NASA Administrator Jim Bridenstine said, referring to the debris' highest point in orbit. "And that kind of activity is not compatible with the future of human space flight that we need to see happen." In calculating the Indian test's potential impact last week, he said NASA determined that the risk of small debris hitting the space station was increased by 44 percent over a period of 10 days. "It's unacceptable, and NASA needs to be very clear about what its impact to us is," Bridenstine said, discussing space debris and India's anti-satellite test at a town hall event Monday. As he spoke about the heightened risk, the NASA administrator also emphasized that both the space station and the astronauts aboard it are safe. The station can be maneuvered out of harm's way if needed, he added. But another danger, he said, is that "when one country does it, then other countries feel like they have to do it, as well." With the test, India announced its arrival as a space power, in the words of Prime Minister Narendra Modi. But it's joining a neighborhood that has been increasingly clouded by space junk — and in arriving, India scattered dangerous new debris into orbit. (1) India is only the 4th country to acquire such a specialised & modern capability. (2) Entire effort is indigenous. India stands tall as a space power! It will make India stronger, even more secure and will further peace and harmony. As NPR's Geoff Brumfiel reported last week, "Experts say the most likely target of Wednesday's test was a satellite launched in January known as Microsat-R. The satellite orbits at between 260 and 282 kilometers (160 and 175 miles) above Earth, making it a relatively low-altitude target." "The good thing is, it's low enough in Earth orbit that over time, this will all dissipate," Bridenstine said on Monday. Those pieces are expected to burn up as they re-enter Earth's atmosphere. That outcome stands in stark contrast with a similar test China performed at a relatively high altitude in 2007, which left potentially dangerous bits that are still shooting around in orbit. India's intercept of its own satellite created 400 pieces of orbital debris, Bridenstine said. "What we are tracking right now — objects big enough to track, we're talking about 10 centimeters [4 inches] or bigger — about 60 pieces have been tracked," he said. "Of those 60, we know that 24 of them are going above the apogee of the International Space Station." Bridenstine went on to discuss the range of commercial activities that are planned for low-Earth orbit — from pharmaceutical to manufacturing enterprises — that could be put at risk by clouds of debris. "What we do know," he said, "is whatever it looks like, it's going to be scary." The U.S. currently tracks about 23,000 pieces of orbital debris, Bridenstine said, adding that tracking ability will be greatly enhanced by the planned "space fence," which could track between 200,000 and 500,000 pieces of debris. The next goal, he said, will be to reduce the dangers associated with those objects. The U.S. has also used its own satellites for target practice, shooting one down in 1985. It did so again in 2008, when a highly classified reconnaissance satellite malfunctioned shortly after reaching orbit. All of the debris from those tests is believed to have eventually fallen safely out of orbit.